Last edited by couponlady; Thu, Jan 24th, 2019 at 01:16 PM. barbis9, [email protected]@, dededi and 1 others like this. It might be worth noting that this offer is only available in the Atlantic region. (From the Terms & Condtions): 1. Eligibility: This Promotion is open only to legal residents of New Brunswick, Prince Edward Island, Nova Scotia and Newfoundland and Labrador who are the age of majority or older in their province/territory of residence at the time of entry. Also, purchases of the bread products must be made at Sobey's stores. Atlantic region only .. thank you for sharing your finds though ! 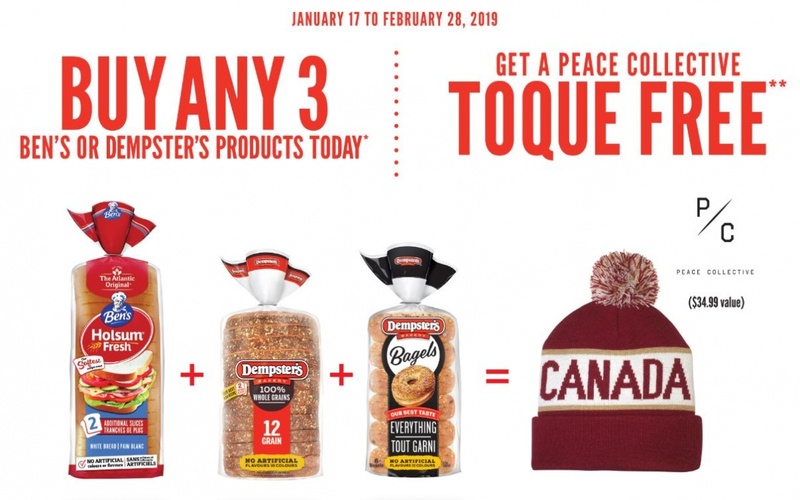 Terms and Conditions of Offer (“Terms”) Sobey’s Ben’s® and Dempster’s® Toque Giveaway (the “Promotion”) sponsored by Canada Bread Company, Limited (the “Sponsor” or “Canada Bread”). 1. Eligibility: This Promotion is open only to legal residents of New Brunswick, Prince Edward Island, Nova Scotia and Newfoundland and Labrador who are the age of majority or older in their province/territory of residence at the time of entry. 2. Offer: Purchase any three (3) Ben’s or Dempster’s® participating products listed in the attached Schedule 1 and enter the offer site January 17, 2019 to February 28, 2019 inclusive (the “Promotion Period”), and receive one (1) Toque (approximate retail value of $34.99 each (“Offer”). Offer only available at participating Sobey’s Stores." bhlombardy, mulock, barbis9 and 1 others like this. couponlady, walkonby, [email protected]@ and 3 others like this. Does it say 3 kinds of products? Or 3 same type would be eligible. From Sobeys. You can buy any 3 from the list of eligible products as shown in the Terms & Conditions. They do not have to be the same 3. If your in Ontario, and not near a Sobey's store, they will accept a receipt from a FreshCo store. I emailed them, because the closest Sobey's for me is more than 2 hours away. They responded with an explanation that FreshCo receipts will be accepted in Ontario. 2shopmom, walkonby, torontogal12 and 1 others like this. I just submitted my reciept from Freshco. It says I will recieve an email about my order in 48 hrs. Should be interesting, because it also say the receipt needs to clearly state the product. My reciept just says sesame bagel, no brand or product number. That is a store issue, not something I can control. And the bagels are on sale for $2.29. I submitted 2 x receipts Jan 19- both showed 'bagel cinnamon raisin' from Sobeys and 2 other products, I purchased 3 x Dempsters products as in list. Approved within 2 days, confirmation shipment in email yesterday!! Ciel and [email protected]@ like this. ***** Update****** After waiting more than a week I submitted a request on the canadabread site about my toque request. They suggested I call them. Before I had a chance to call them today, I recieved a email stating my request for a toque was DECLINED. i called them. I was told Freshco was NOT included. Luckily I still had my email where I was told yes I could buy from Freshco. So after getting put on hold a couple of times (I felt sorry for the rep. He was trying so hard to help), I was told Freshco was suppose to be included, but at the last monent it was removed from the offer. SO, no toque, but I am getting some FPC's for five products to cover the 3 I bought and 2 more because they can't send out a toque. My apologies to anyone who bought and submitted from Freshco....I was simply sharing their email to me, not knowing they were more confused than me! Ciel, 2shopmom, [email protected]@ and 1 others like this. Thank you for participating in the Sobey's Dempster's and Ben's Toque Giveaway. Your receipt has been successfully validated! Please allow six (6) to eight (8) weeks for delivery. If you have any questions or concerns about this giveaway, please contact our Customer Service atcanadabread.com/contact-us or 1-800-465-5515 between 8:30am and 5:30pm EST. *See official terms and conditions for full details including participating products and request limits. Last edited by tjthemanto; Mon, Feb 25th, 2019 at 01:44 PM. So in about 5 weeks after receipt upload, they are shipping them. Mine was approved today, so maybe by last week of March they will ship them out.